Mog'Dor the Fire Dragon strikes again! From his nest in the eastern mountains he came, incinerating the countryside and all the people who would dare stand between him and his goal: the city of Arcadia. Unless the squabbling Guilds can put aside their differences for a moment and band together against this fiery threat, Arcadia will burn to the ground. 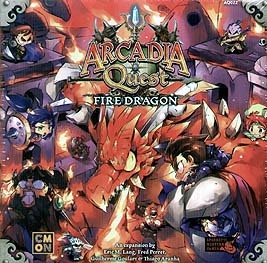 Arcadia Quest: Fire Dragon is an expansion that extends any campaign in the Arcadia Quest line into a truly epic encounter against the majestic Fire Dragon! Divided into two scenarios, Heroes will first need to compete to bring down the dragon, and then cooperate to ultimately defeat it. Equip your Heroes with amazing Level 6 upgrades, gain legendary Arcadian relics, and conquer the power of the Fire Dragon and its incendiary bombs. Take your Arcadia Quest campaign to a whole new level. With the Fire Dragon in town, the battle will be more heated than ever!